Charter Communications Inc. is near an agreement to buy Time Warner Cable Inc. for about $55.1 billion in cash and stock, after French billionaire Patrick Drahi expressed interest in the assets, according to people familiar with the matter. Charter will pay about $195 a share — 14 percent above Time Warner Cable’s closing price on May 22 — with $100 in cash and the rest in its own stock, said the people, who asked not to be identified because the talks are confidential. The deal could be announced as soon as Tuesday, they said. Bright House Networks, a smaller cable company that Charter is trying to buy, will also be merged into the combined entity, they said. Charter, the fourth-biggest U.S. cable company, is making its second move on No. 2 Time Warner Cable after its early 2014 bid was rejected and Comcast Corp. swooped in with a competing offer. Charter and its biggest shareholder, billionaire John Malone, got another shot when the Comcast deal fell apart in April because of regulatory scrutiny. They also faced last-minute competition from Drahi’s Altice SA, which held merger talks with Time Warner Cable over the past days. Spokespeople for Charter, Time Warner Cable and Altice declined to comment. Time Warner Cable shareholders will have the option to accept as much as $115 a share in cash and less Charter stock, the people said. The deal value of $55.1 billion is for Time Warner’s equity. Charter also will assume debt in the transaction. 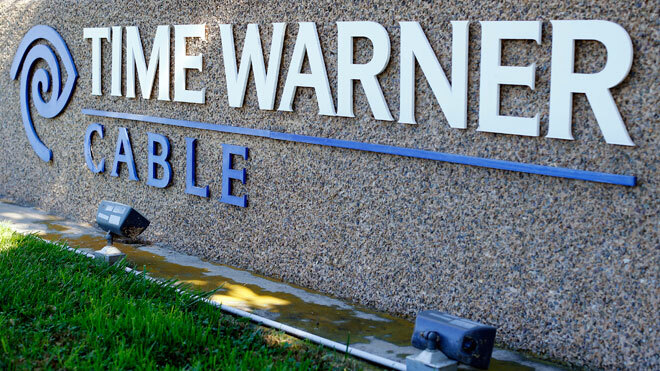 Shares of Time Warner Cable jumped 10 percent to the equivalent of $189.06 in German trading at 9 a.m. Frankfurt time. Altice declined 1.5 percent in Amsterdam. Dealmaking is heating up in an industry facing waning demand for traditional pay-TV packages and competition from Netflix, Amazon and other online services. Adding Time Warner Cable would enable Stamford, Connecticut-based Charter to almost quadruple the number of its cable subscribers, gaining customers in cities including New York, Los Angeles and Dallas. The combined business would have about 17 million basic cable customers, second to Comcast’s 22 million. The bigger company would get more leverage when negotiating contracts with television networks. While many analysts predicted a tie-up between Charter and Time Warner Cable, Drahi made surprise foray into the U.S. on May 20 with the announcement of plans to buy a much smaller rival, Suddenlink Communications. While in the country, he also met with Time Warner Cable Chief Executive Officer Rob Marcus, according to a person with knowledge of the matter. Going after Time Warner Cable just days after agreeing to take control of Suddenlink, the No. 7. in the industry, would be the boldest move yet for Drahi. The Franco-Israeli billionaire has built up a telecommunications and cable empire that so far stretches from France, Israel, Portugal to the Caribbean. At $55.1 billion, Charter’s offer will be difficult to top for Altice, a Luxembourg-based company that has a market value of about 32 billion euros ($35 billion) and ballooning debt. “It would be hard for Altice to structure a deal that would be as compelling for Time Warner Cables’ shareholders as a Charter deal,” said Moffett, the MoffettNathanson analyst. Liberty Broadband Corp., the Malone entity that holds the stake in Charter as well as shares of Time Warner Cable, will buy $5 billion of new Charter stock at the current price to help fund the deal, said the people. The transaction also has a breakup fee of $2 billion, which anticipates a possible bid by Drahi’s Altice SA and antitrust concerns, they said. Charter has also been renegotiating its offer to buy billionaire Si Newhouse Jr.’s Bright House for $10.4 billion. That agreement had been in jeopardy because it depended on Comcast closing its merger with Time Warner Cable, which has the right to match or block the deal because of a longstanding arrangement to negotiate programming and other deals for Bright House. Cable providers have been expanding their Internet offerings to help offset the loss of cable subscribers. By opposing the Comcast merger, regulators have showed they are taking a hard look at deals that give companies too much power over broadband Internet, which is increasingly becoming the way that people watch TV. Federal Communications Commission Chairman Tom Wheeler called Time Warner Cable’s Marcus and Charter CEO Tom Rutledge recently to dispel notions that industry mergers won’t be approved by regulators, a person with knowledge of the calls has said. Wheeler told the CEOs that any transaction would be judged on merit, and there was no flat ban on cable combinations, the person said. Investors have been anticipating more deals. Cablevision Systems Corp., the No. 5 in the industry, rose 17 percent on May 20, the day Altice agreed to buy a controlling stake in Suddenlink Communications.